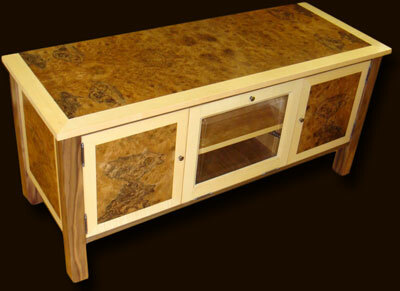 Stunning art deco inspired television stand, shown here in Burr walnut and fiddle maple on American walnut legs. Comes with feature panels on the sides, a storage cupboards for media and a hardware section behind a bevelled glass door. Adjustble shelving throughout. We can make these TV stands in any size or specificaction and using any combination of the eight wood choices listed below.